A spray applied marking paint for contractors/surveyors spot marking. Colour coded for electric, gas, water and cable company use. Semi permanent formula lasts at least 3 months after application. 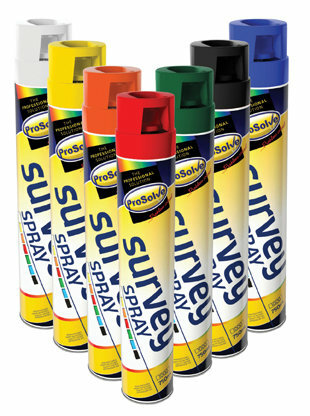 Survey Line is available in seven different colours: White (General Marker), Red (Electricity), Yellow (General Marker), Blue (Water), Orange (General Market), Green (Cable Work) and Black (Covering Old Lines). .